electric shock. Therefore, it is dangerous to make any kind of contact with any part inside this unit. has been included. Therefore, it should be read carefully in order to avoid any problems. AC voltage of the power outlet and has been approved by and complies with the safety standard of your particular country. voltage of the AC power outlet being used. This product can only be serviced in the country where it was purchased. as not to interfere with radio and television reception. and meet the following condition. Please use the supplied shielded video signal cable. Use of other cables and adapters may cause interference with radio and television reception. Consult your dealer or an experienced radio/TV technician for help. If necessary, the user should contact the dealer or an experienced radio/television technician for additional suggestions. Washington, D.C., 20402, Stock No. 004-000-00345-4. U.S. 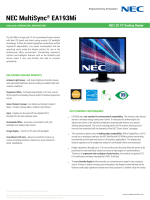 Responsible Party: NEC Display Solutions of America, Inc.
to the technical standards as specified in the FCC Rules. The intended primary use of this product is as an Information Technical Equipment in an office or domestic environment. 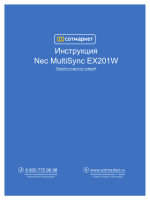 The product is intended to be connected to a computer and is not intended for the display of television broadcast signals. Windows is a registered trademark of Microsoft Corporation. NEC is a registered trademark of NEC Corporation. ENERGY STAR is a U.S. registered trademark. endorsement of any product or service. you to dangerous shock hazards or other risks. Refer all servicing to qualified service personnel. Do not spill any liquids into the cabinet or use your monitor near water. fatal or may cause electric shock, fire or equipment failure. Do not place any heavy objects on the power cord. Damage to the cord may cause shock or fire. The power supply cord you use must have been approved by and comply with the safety standards of your country. 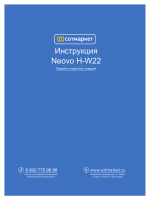 (Type H05VV-F 3G 0.75 mm2 should be used in Europe). In UK, use a BS-approved power cord with molded plug having a black (5A) fuse installed for use with this monitor. Do not place any objects onto the monitor and do not use the monitor outdoors. Do not bend power cord. 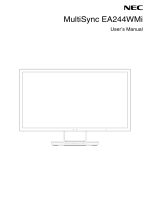 Do not use monitor in high temperatured, humid, dusty, or oily areas. Do not cover vent on monitor. Vibration can damage the backlight. Do not install where the monitor will be exposed to continual vibration. If monitor or glass is broken, do not come in contact with the liquid crystal and handle with care. monitor in a stable location and take measures to prevent falling. If the monitor stand has been cracked or peeled. If the monitor has been wobbled. If the monitor has an unusual odor. If liquid has been spilled, or objects have fallen into the monitor. If the monitor has been exposed to rain or water. If the monitor has been dropped or the cabinet damaged. If the monitor does not operate normally by following operating instructions. openings or place the monitor near a radiator or other heat sources. Do not put anything on top of monitor. The power cable connector is the primary means of detaching the system from the power supply. The monitor should be installed close to a power outlet which is easily accessible. Do not touch LCD panel surface while transporting, mounting and setting. Applying pressure on the LCD panel can cause serious damage. Image Persistence: Image persistence is when a residual or вЂњghostвЂќ image of a previous image remains visible on the screen. of time should be avoided. To alleviate image persistence, turn off the monitor for as long as the previous image was displayed. one hour to erase the image. intervals whenever the screen is idle or turning off the monitor when not in use. For optimum performance, allow 20 minutes for the display to warm up. Adjust the monitor height so that the top of the screen is at or slightly below eye level. Your eyes should look slightly downward when viewing the middle of the screen. 70 cm (27.56 inches) from your eyes. The optimal distance is 50 cm (19.69 inches). Rest your eyes periodically by focusing on an object at least 20 feet away. Blink often. and reflections. Adjust the monitor tilt so that ceiling lights do not reflect on your screen. If reflected light makes it hard for you to see your screen, use an anti-glare filter. cleaning solution or glass cleaner! Adjust the monitorвЂ™s brightness and contrast controls to enhance readability. Use a document holder placed close to the screen. turning your head while you are typing. Avoid displaying fixed patterns on the monitor for long periods of time to avoid image persistence (after-image effects). Do not position the Contrast control to its maximum setting. Use the preset Size and Position controls with standard signals. Use the preset Color Setting. Use non-interlaced signals with a vertical refresh rate between 60-75 Hz. When the LCD is dusty, please gently wipe with a soft cloth. Do not rub the LCD panel with coarse or hard material. Do not apply pressure to the LCD surface. Do not use OA cleaner as it will cause deterioration or discoloration to the LCD surface. To clean the cabinet, dampen the cloth with a neutral detergent and water, wipe the cabinet and follow with a dry cloth. vinyl to the cabinet for a long time. These types of fluids and fabrics can cause the paint to deteriorate, crack or peel. Workstations - ANSI/HFES 100-2007 - The Human Factors Society, Inc. P.O. Box 1369, Santa Monica, California 90406. Remember to save your original box and packing material to transport or ship the monitor. *1 Type of power cord included will depend on the where the LCD monitor is to be shipped. 1. Place monitor face down on a non-abrasive surface (Figure 1). Handle with care when monitor facing down, for avoiding damage to the front control buttons. 2. Please pivot base 90 degrees as shown in Figure 1. Handle with care when pulling the stand. 3. Attach the base stand to LCD monitor and properly lock screw of base stand bottom (Figure 2). Reverse this procedure if you need to re-pack the monitor. Make sure to read вЂњRecommended UseвЂќ (page 4) before installation. 1. Turn off the power of your computer. (Figure A.1). Tighten all screws. cable to the Macintosh cable adapter (Figure A.3). Some Macintosh systems do not require any Macintosh cable adapter. 1. Please use a DisplayPort cable with DisplayPort logo. 2. When removing the DisplayPort cable, hold down the top button to release the lock. 3. The DisplayPort connector does not supply power to the connected component. 4. Connect all cables to the appropriate connectors (Figure C.1). quality/components of LCD module and/or shorten the moduleвЂ™s life. you might pinch your fingers. 5. To keep the cables neatly organized, place them into the cable management system that is built into the stand. Place the cables in the hooks firmly and evenly (Figure C.2 and Figure C.3). Cable cover is not removable. 6. Please check that you can still rotate, raise and lower the monitor screen after you have installed the cables. 7. Connect one end of the power cord to the AC inlet on the back of the monitor and the other end to the power outlet. Please refer to Caution section of this manual for proper selection of AC power cord. 8. Turn on the computer, then turn on the monitor by pressing the power sign on the front bezel (Figure E.1). Refer to the Controls section of this UserвЂ™s Manual for a full description of these OSD controls. If you have any problems, please refer to the Troubleshooting section of this UserвЂ™s Manual. The monitor may be raised or lowered in either portrait or landscape mode. To raise or lower screen, place a hand on each side of the monitor and lift or lower to the desired height (Figure RL.1). Handle with care when raising or lowering the monitor screen. knocking the screen on the desk or pinching your fingers. 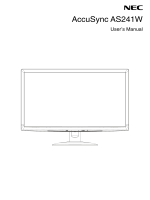 To raise the screen, place a hand on each side of the monitor and lift up to the highest position (Figure RL.1). To rotate screen, place a hand on each side of the monitor screen and turn clockwise from landscape to portrait or counterclockwise from portrait to landscape (Figure R.1). Grasp the top and bottom sides of the monitor screen with your hands and adjust the tilt and swivel as desired (Figure TS.1). Handle with care when tilting the monitor screen. This LCD monitor is designed for use with a flexible arm. Follow the instructions provided by the manufacturer of the display mount. To meet the safety requirements, the mounting stand must be able to support the weight of the monitor and be UL-certified. 2. Place a hand on each side of the monitor and lift up to the highest position. 3. Place monitor face down on a non-abrasive surface (Figure S.1). Handle with care when the monitor is facing down. 4. Remove the 4 screws connecting the stand to the monitor (Figure S.1). In order to avoid stand drop, when removing screws, please support stand with your hand. 5. Remove the stand (Figure S.2). 6. The monitor is now ready for mounting in an alternate manner. 7. Connect the cables to the back of the monitor. Handle with care when removing monitor stand. 8. Reverse this process to re-attach stand. Use only VESA-compatible alternative mounting method. Handle with care when removing stand. Match вЂњTOP SIDEвЂќ mark on stand to top side of the monitor head when re-attaching stand. 1. Follow the instructions on how Remove Monitor Stand for Mounting to remove the stand. 2. Use the 4 screws removed from the stand to attach the arm to the monitor (Figure F.1). Caution: Use ONLY the screws (4 pcs) that were removed from the stand to avoid damage to the monitor or stand. approved arm (e.g. GS mark). 1. The monitor head tilt function may experience impaired operation when attached to the lower position VESA holes. 2. The monitor head pivot function should not be used when attached to the lower position VESA holes. Not displaying on screen Selects input signal. Adjusts the overall image and background screen brightness. To enter the ECO MODE, touch the вЂњINPUT/RESETвЂќ button. ECO MODE OFF: Sets brightness variable from 0% to 100%. ECO MODE1: Sets brightness 80%. ECO MODE2: Sets brightness 40%. This setting can adjust brightness within the range that power has reduced 30% from maximum brightness setting. Adjusts the image brightness in relation to the background. To enter the DV MODE setting, touch the вЂњINPUT/RESETвЂќ button. DV MODE: Setting that adjusts the brightness by detecting the screenвЂ™s black areas and optimizes it. Adjusts the image displayed for non-standard video inputs. Automatically adjusts the Image Position, the H. Size and Fine setting. Controls Horizontal Image Position within the display area of the LCD. Controls Vertical Image Position within the display area of the LCD. Adjusts the horizontal size by increasing or decreasing this setting. Improves focus, clarity and image stability by increasing or decreasing this setting. Five color presets (9300/7500/sRGB/USER/NATIVE) select the desired color setting. Increase or decreases Red. The change will appear on screen. Increase or decreases Green. The change will appear on screen. Increase or decreases Blue. The change will appear on screen. Selecting TOOL allows you to get into the sub menu. Selecting OSD TOOL allows you to get into the sub menu. control to be reset and touching the INPUT/RESET button. Controls the volume of the speakers or headphones. To mute the speaker output, select Audio icon and touch вЂњINPUT/RESETвЂќ. Selecting EXIT allows you exit OSD menu/ sub menu. This function works, when input signal timing is under native resolution. FULL: The image is expanded to full screen, regardless of the resolution. ASPECT: The image is expanded without changing the aspect ratio. Turns the Response Improve function on or off. Response Improve may reduce blurring that occurs in some moving images. Turns ON or OFF the two way communication and control of the monitor. Displays the estimated carbon saving information in kg. The carbon footprint factor in the carbon saving calculation is based on the OECD (2008 Edition). The carbon saving information can be reset by touching the INPUT/RESET button. Displays the estimated carbon usages information in kg. This is the arithmetic estimation, not actual measurement value. The carbon footprint factor in the carbon usage calculation is based on the OECD (2008 Edition). The carbon usage information can be reset by touching the INPUT/RESET button. Indicates the model and serial numbers of your monitor. This function works, when user selects below special input signal timing. 1280x768, 1360x768, 1366x768: Determines the resolution to 1280x768, 1360x768 or 1366x768. 1400x1050, 1680x1050: Determines the resolution to 1400x1050 or 1680x1050. OSD control menus are available in nine languages. 10 - 120 seconds by 5 seconds step. deactivate, touch SELECT, then repeat the same steps until OSD main menu displays on screen. 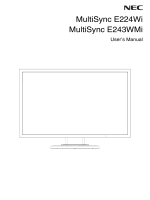 If you select вЂњONвЂќ, monitor displays вЂњVIDEO INPUT MENUвЂќ after changing the input. If you select вЂњOFFвЂќ, monitor doesnвЂ™t display вЂњVIDEO INPUT MENUвЂќ after changing the input. This function selects AUDIO INPUT or DISPLAYPORT. OSD Warning menus disappear by touching SELECT. change of input signal or video is inactive, the NO SIGNAL window will appear. Contrast ratio, DV MODE ON). Depends on display card used. not support all modes listed). resolution for optimal display performance. pixel, so to expand resolutions to full screen, an interpolation of the resolution must be done. Reduced Footprint: Provides the ideal solution for environments with space constraints that still require superior image quality. The monitorвЂ™s small footprint and low weight allow it to be moved or transported easily from one location to another. No Touch Auto Adjust (Analog input only): Automatically adjusts the monitor to optimal settings upon initial setup. footprint and compliance with MPRII and TCO guidelines for lower emissions. air conditioning costs of the workplace. conversion factor - conversion factor is based on OECD publication of global CO2 emissions 2008 Edition). This monitor has a manufacturing carbon footprint of approximately 36.0 kg. This monitor has a manufacturing carbon footprint of approximately 37.3 kg. for its monitors and are accurate at the time of printing. NEC reserves the right to publish updated carbon footprint values. and might not be displayed due to the decision/intention of the HDCP community (Digital Content Protection, LLC). connectivity. It enables the highest resolutions, the fastest refresh rates and deepest color depths over standard cables. вЂў The signal cable should be completely connected to the display card/computer. The monitor does not support DisplayPort converter signal. Check front power Switch and computer power switch should be in the ON position. вЂў Unplug the power cord of the monitor from the AC outlet to turn off and reset the monitor. вЂў Image persistence is when a вЂњghostвЂќ of an image remains on the screen even after the monitor has been turned off. period of time should be avoided. clock or resolution is too high. Choose one of the supported modes. вЂў Signal cable should be completely attached to the computer. display mode is changed, the OSD Image Adjust settings may need to be re-adjusted. Check the monitor and your display card with respect to compatibility and recommended signal timings. If your text is garbled, change the video mode to non-interlace and use 60 Hz refresh rate. вЂў Make sure ECO MODE is turned off. вЂў Power Switch should be in the ON position and power cord should be connected. вЂў Use the OSD Image Adjust controls to increase or decrease the H.SIZE. вЂў If no video is present on the screen, turn the Power button off and on again. cord under low resolution with DisplayPort. вЂў Check to see if speaker cable is properly connected. Check to see if mute is activated. Check to see if volume in OSD is set at minimum. Check selected OSDвЂ™s Tools to вЂњSOUND INPUTвЂќ, when DisplayPort is in use. вЂў Change DV MODE to OFF and adjust brightness. When DV MODE is set to ON, the monitor automatically adjusts brightness based on the environment. When the brightness of surrounding environment changes, the monitor will also change. All certiГћed product models have been tested in an independent, accredited laboratory. Гћnd a searchable database of all TCO CertiГћed IT products. ISO (International Organisation for Standardization) and TCO (Swedish Trades Union). and gives advice on how to handle the product in an environmentally sensitive way, once it has reached the end of its life. the Energy Saving mode is activated. The monitor enters a single Energy Saving mode. the product, or if applicable, follow any agreements made between yourself and NEC. so as to comply with the correct disposal method.